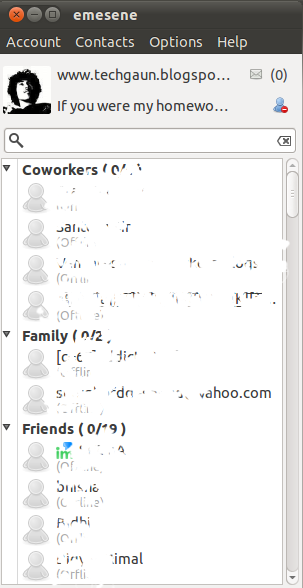 I lately upgraded my firefox 3.6 to firefox 4 and so far it looks pretty good and I am having fun with the new firefox. But many of the old add-ons were not working and I had to upgrade them as well. Among them, torbutton was also not working so I checked the mozilla addons site but apparently didn't find any update to it. I could each time edit the network preferences to set the proxy but I am too lazy to do that always so checked the torproject site and found new release of torbutton. Torproject has released alpha version of new torbutton that will work for firefox for now. Though its still in testing phase and might need to be worked on, we can still use it and seems to work well except I can't see the menus properly when I right-click on the torbutton icon. To download and install torbutton in FF4, Click Here. Btw, the new add-on manager makes the installation process pretty simple and sleek. emesene has got very simple and cool graphics and is fully coded in python using pyGTK, GTK+. Hence, its a cross platform messenger with binaries available for different platforms and the source code available under GNU GPL license. Following part is taken from wikipedia entry on emesene. 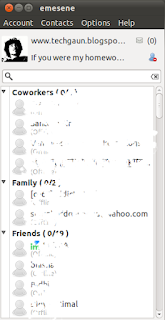 The current version of emesene is compatible with the Windows Live Messenger protocol MSNP15. To download and install emesene under under OS, you can go to the Download page of emesene. Sometimes, we might need to pass arbitrary number of arguments in PHP and probably we might have been using the option arguments feature of PHP for this purpose but we have got yet another function that can be utilized for passing arbitrary number of arguments to your functions. func_get_args() is a very useful function available to achieve the passing of arbitrary number of arguments. The function returns the array of the arguments passed to the function. The following sample code will clarify. //now we could do anything with them..
Hope it helps some of you out there. Based on the work of rdesktop, xrdp uses the remote desktop protocol to present a GUI to the user. The goal of this project is to provide a fully functional Linux terminal server, capable of accepting connections from rdesktop and Microsoft's own terminal server / remote desktop clients. 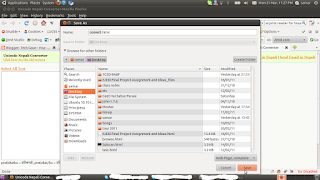 We can download and install the xRDP directly from the ubuntu software center under ubuntu and the source can be downloaded for other distros. After the installation, we can execute the command from the terminal as below to verify if its working correctly or not. In the sunde terminals and probably in other such hardware products, we don't have to remember this command. Sunde gives us the option to choose Linux from the configuration display and that would be enough for running xRDP. And it seems to work pretty fast. You might sometimes need to copy a single file to all the subdirectories and this can be easily achieved with linux terminal by simply using some commands. Below is how I copied password.txt file to all the subdirectories inside the Moviez directory from terminal. Backtrack Linux is the most widely used security pentesting distro and its now near to v. 5. The backtrack team has announced the release date of the BT5. Sometimes, we might need to use unicodenepali.com converter and we might not have access to the internet. But, by just saving the complete webpage of the converter, you could get the offline version of the converter. Now you can take the downloaded html and its related files anywhere and open the html file to run the converter offline. Even better, if you are windows user, you could save .hta version from Internet explorer and could make a single file of the converter in your own computer. Recently, I and my friends had to implement netpoint protocol to setup the server/client eLibrary environment in one of the schools in Nepal. In this post, I will list the steps to follow while setting up such terminals. By the way, the terminals we used were Sunde terminals. This is pretty short tutorial without going into details because I assume that the person who performs these installation has good knowledge of how computers work. b) Select and run one of the Sunde terminal clients. Its for downloading the necessary softwares to our server machine as the necessary softwares are hosted in the Sunde terminal clients. c) Connect the server and client with ethernet cable and set static IP address for both the server and client. d) Run the internet explorer and type the I.P. address of the sunde client in address bar. e) You'll find a page from where you can download netpoint setup file and user guide as well. (Also, xRDP for linux is available for download). f) Install the netpoint setup software in your server machine and it will have netpoint protocol and netpoint management GUI installed in it. h) If you want to setup DHCP server in your server, you could do so. Otherwise setting up the static IP would be enough. Now, set the static IPs for all the clients and also set the server IP in all those clients. Your sunde terminals are now ready to go. If you get messages like "can not connect to server", ensure that server IP in the clients is correct and also make sure the physical things such as NIC, ethernet cable, etc. are working correctly. If you get the login window and can't login with the user, make sure those users are assigned to group "Remote Desktop Users". Also, sometimes you might need to turn firewall off in the server. I might have missed some stuffs while writing this. If you face any problem, feel free to comment. And I am sorry that I could not provide you any screenshots. Maybe sometimes later when I got the next netpoint deployment(but its unlikely). Also, you can use Linux in the server and in that case, you will have to use xRDP or any other RDP protocol server software for linux. I've been using boot-up manager to graphically configure and manage the init scripts run according to the run level. And its pretty useful. So I thought to share about this application in this post. * You are breaking the logical chain stated in debian-policy concerning runlevel configuration. If the logic of a debian-like system boot up sequence is not very clear and familiar to you, you should not play with symlinks, permissions, etc. In order to avoid messing up your system, Boot-Up Manager will automate all of your configuration in a nice and clean graphical interface. 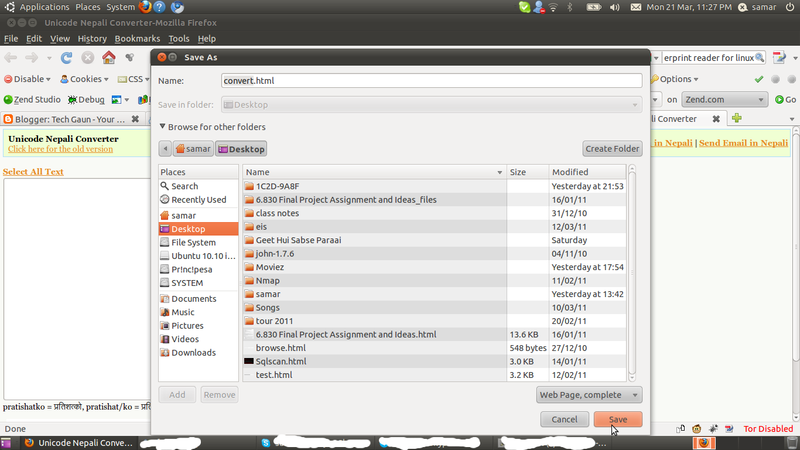 Deb files are available for download for other debian based systems. You could refer to the above mentioned links for more technical details on bum. With the help of HeNN(Help Nepal Network), we've been on our visit to two schools of Baglung and Myagdi. We were the group of three, Arnab Sarkar, Bikash Kharel and me(we all are from Kathmandu University). Our deployment visit has come to an end and we are on our way back to Dhulikhel. The visit was full of fun and gave me new experience of working in team(though the team was extremely small :p). We had lots of fun in both places and received pretty good response from the local people. Our journey started on March 4 and we took our bus to Bhimgithe-8, Khaala, Baglung. The journey was full of adventures. Thank god, the bus was third class due to which I got a chance to taste the tea without sugar (It was great, btw :D). We didn't sleep for the whole night and our dinner was at around 11 pm at night. The real adventure began when we reached Ridi, one of the more known places from Gulmi. The road was, well, so narrow that only the tires of the bus were on the road and outer parts of the bus were out of the track. A small mistake and our bus would fall down to the river and we were excited and scared at the same time. Moreover, the driver of our bus had not been sleeping for more than 24 hours so we were even more scared. On the next day of our journey, we had to face some problem with traffic police regarding the horn used in the bus. At around 10:30 we arrived at Khaala, our first destination. We were excited to see such a big mass from such a small village for welcoming us. All the computer materials and accessories were stored in the school's storeroom and we were glad to find all the materials in the good condition after such a "ghandryaang-ghundrung" journey. The furnitures and computer room were not ready yet so we took full rest on our first day. Next day, we started to setup the LTSP clients and the task was completed in around 2 hours. We were helped by the local villagers, teachers and even the principal of the school in setting up the system. After finishing the setup, we started to train the teachers and students. Everyone seemed to be so interested with this new "computer" object and we felt so glad to see such involvement of everybody. On the next day, we again gave training to the teachers as well as students so that they would be familiar with the system. In the late hours, we provided teachers information about how to troubleshoot the general problems they might face with the system. We now had to go to Histan-6, Rima, Myagdi for our next deployment task. Next day, we headed to Myagdi district for our next deployment at Adarsha Madhyamik Vidhyalaya, Rima, Myagdi. We spent our first night in Myagdi in Tatopani. Next day, we took a short warm shower in Tatopani and then quickly headed to Beni to catch the bus for Baisari. In next two hours, we were already in Baisari. Now one of the toughest time of our visit had come and we had to walk uphill for around 3 hours(local villagers require 1.5 hours :P). We were tired and hence decided to pass that night at Aula, 30 min below Rima. Next day, we went to Rima school and soon thought of starting our work. But unfortunately, the electricity transmission line was down and we had to wait for the next day. We faced multiple problems due to electricity and lack of materials in Rima school. Edubuntu didn't seem to like the hard disk and never wanted to install. Btw, it was not actually LTSP deployment but it was a RDP deployment. Not being successful with Edubuntu, we decided to install Windoze XP and again with more hurdles(loadshedding being the major one), we finished all the tasks. We had to stay for 4 days at Rima to finish all the tasks. Finally the system was up and we were very glad to see it working. We are right now on our way back to Dhulikhel and we've managed a small meeting with Mahabir Pun, the MAN from Myagdi. Both deployments were successful and personally I gained lots of experience and practical knowledge(Running LTSP under virtualbox and deploying a full LTSP terminals are two entirely different things).